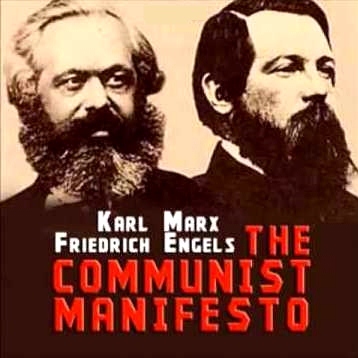 In Defense of Communism: Karl Marx, Friedrich Engels- Manifesto of the Communist Party (1848) Part IV "Position of the Communists in Relation to the Various Existing Opposition Parties"
Karl Marx, Friedrich Engels- Manifesto of the Communist Party (1848) Part IV "Position of the Communists in Relation to the Various Existing Opposition Parties"
IV. POSITION OF THE COMMUNISTS IN RELATION TO THE VARIOUS EXISTING OPPOSITION PARTIES. The Communists fight for the attainment of the immediate aims, for the enforcement of the momentary interests of the working class; but in the movement of the present, they also represent and take care of the future of that movement. In France, the Communists ally with the Social-Democrats# against the conservative and radical bourgeoisie, reserving, however, the right to take up a critical position in regard to phases and illusions traditionally handed down from the great Revolution. # The party then represented in Parliament by Ledru-Rollin, in literature by Louis Blanc, in the daily press by the Réforme. The name of Social-Democracy signifies, with these its inventors, a section of the Democratic or Republican Party more or less tinged with socialism. [Engels, English Edition 1888].